Hawking’s logic on aliens is, for him, unusually simple. The universe, he points out, has 100 billion galaxies, each containing hundreds of millions of stars. In such a big place, Earth is unlikely to be the only planet where life has evolved. The answer, he suggests, is that most of it will be the equivalent of microbes or simple animals — the sort of life that has dominated Earth for most of its history. One scene in his documentary for the Discovery Channel shows herds of two-legged herbivores browsing on an alien cliff-face where they are picked off by flying, yellow lizard-like predators. Another shows glowing fluorescent aquatic animals forming vast shoals in the oceans thought to underlie the thick ice coating Europa, one of the moons of Jupiter. The completion of the documentary marks a triumph for Hawking, now 68, who is paralysed by motor neurone disease and has very limited powers of communication. The project took him and his producers three years, during which he insisted on rewriting large chunks of the script and checking the filming. 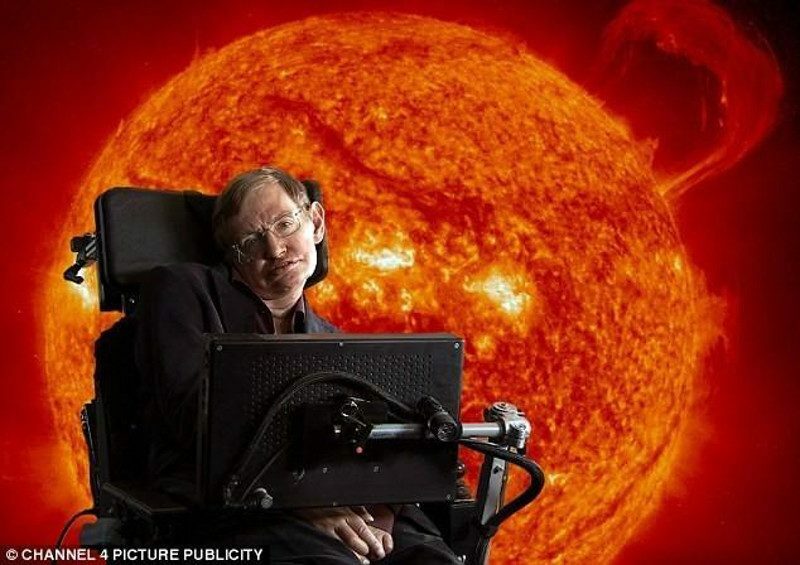 Hawking has suggested the possibility of alien life before but his views have been clarified by a series of scientific breakthroughs, such as the discovery, since 1995, of more than 450 planets orbiting distant stars, showing that planets are a common phenomenon. So far, all the new planets found have been far larger than Earth, but only because the telescopes used to detect them are not sensitive enough to detect Earth-sized bodies at such distances. Another breakthrough is the discovery that life on Earth has proven able to colonise its most extreme environments. If life can survive and evolve there, scientists reason, then perhaps nowhere is out of bounds. Hawking’s belief in aliens places him in good scientific company. In his recent Wonders of the Solar System BBC series, Professor Brian Cox backed the idea, too, suggesting Mars, Europa and Titan, a moon of Saturn, as likely places to look. Similarly, Lord Rees, the astronomer royal, warned in a lecture earlier this year that aliens might prove to be beyond human understanding.